Need a quick something for that someone special? Give the gift of our breakfast burritos & specialty sandwiches today! Whether it’s for birthdays, holidays, a promotion at work, or that time you forgot your anniversary (shame on you btw). Does your Mom have a sudden urge for a Spicy Drunken Turkey wrap? Does Dad need one of our Famous Hangover Cure breakfast burritos? Don’t worry, we don’t judge. No matter what the occassion may be, our food makes a great gift. 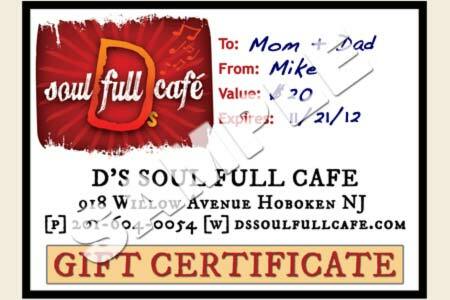 So order one or more of our gift certificates today. Starting at $10 and available in $5 increments after that. Call us at 201-604-0054 or stop in for more info. During the hectic Holiday Season, we wanna make your shopping easier while saving you some money, too. So from November 15 thru December 31 (every year), you can save 10% whenever you buy a gift certificate. Call us at 201-604-0054 or stop in.